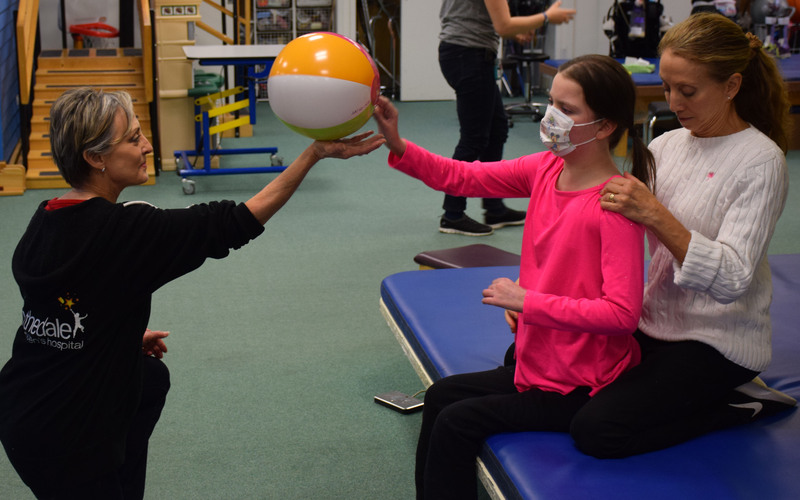 Rebecca works to regain upper body strength and control with her occupational and physical therapists. Rebecca has always been a fighter, even before birth. The 12-year-old was diagnosed in utero with hypoplastic left heart syndrome, a congenital heart defect. Throughout her life, Rebecca has endured a variety of procedures related to her diagnosis, but none prevented her from enjoying her activities and attending school with her friends. Last spring, however, an irregular heartbeat raised the concerns of her doctors. This prompted the placement of a pacemaker and cardiac valve replacement in August. Following that surgery, she was placed on Extracorporeal Membrane Oxygenation (ECMO) - an advanced life-support technique that utilizes a heart-lung bypass machine to provide breathing and heart support when other standard treatments are no longer viable. Rebecca's condition continued to deteriorate and within just two days of being placed on ECMO, she suffered her first stroke. She underwent life-saving heart transplant surgery in September, but her post-operative course was complicated by a second stroke, and respiratory failure requiring ventilator support. Rebecca faced myriad medical complications, including cardiac rejection, acute kidney injuries and an acquired brain injury which left her with difficulty swallowing, an inability to communicate, and limited use of her extremities. In December, after she was weaned from the ventilator, her transplant team determined that she was medically stable enough to be transferred to Blythedale Children’s Hospital. Upon admission for cardiac rehabilitation and medical management of her complex condition, Rebecca's new multidisciplinary team went right to work. Blood levels and antibiotics were monitored to help promote wound healing, while 24/7 medical care helped restore her health and strength to thrive in therapies. All the while, the Blythedale team remains in close contact with Rebecca's cardiac transplant team, to ensure that all her post-transplant needs are met. As Rebecca’s condition improved, her speech therapists transitioned her to a puree diet, enabling her to eat by mouth again, while also weaning her from her previously needed feeding tube. Rebecca also needed to relearn how to communicate. Her speech therapists initially utilized assistive technology like the Tobii Dynavox, a device which tracks eye movement and generates speech. Rebecca recently regained her ability to speak independently, saying "I love you" to her mom. The pre-teen is also regaining movement in her long-dormant lower extremities through an intensive daily physical therapy regimen. Simultaneously, her occupational therapists are working toward improving her upper-extremity function to increase her independence and enable her to more actively participate in self-care, such as getting dressed and brushing her teeth. Rebecca's devoted parents have been by her side through past and present cardiac challenges. Now at Blythedale Children’s Hospital, witnessing their daughter’s improvements first-hand, they look forward to the future.